We design and build furniture that is lasting, functional and a handsome addition to any home or setting. A Nomad bookcase is not only a perfect way to store your favorite paperback or hardback books, but also CDs and DVD movies as well. Designed to mirror the tree from which this wood comes, the side piece widens at the bottom and then tapers to a root-like base. This 5-shelf bookcase makes the most of your space and can be used alone or grouped (Group of three shown) for a complete storage system. Set the top shelf low to provide built-in bookends. The upper four shelves are 5 inches deep and can be adjusted up or down by the inch for versatility. The stationary bottom shelf widens to 6 1/2 inches and the widening base design allows ample storage room under the bottom shelf for larger books. Why is it called the Nomad? Because it’s easy to move! It knocks down and sets up in minutes. Sleek lines and strong joints combine with a Danish oil finish to make a sturdy, well built piece of furniture that will last a lifetime, no matter where you take it. This bookcase takes up only 20" of wall space but provides yards of storage. It’s designed to fit neatly over baseboard to hug the wall. The Nomad bookcase is available in Red Oak or Hard Maple. Nomad Bookcase (three shown). Shown in Oak. Note the cut-away for the base board. You can put them together for a unified look. Top Tall Bed Table 12" x 20" x "
Left and Right Bed Tables shown in Oak. Order in our wood Red Oak or Hard Maple. Sandia Stool/Table used as a bench. A beautiful match is the Placitas End table. You can order with the Blue Starburst or in Natural Starburst. Under-bed Drawers come in two styles. Both styles have front panel made from wood of your choice Red Oak or Hard Maple. S.U.B. are more economical and S.S.U.B. uses matching wood on the side panels. Dimensions are 34" x 17" x 7" high. . The Mission End Table is a beautiful accessory to the Mission bed with the wide slats and built strong to last a lifetime. Bed Tables, Coffee Table, or End Tables may be mixed with different bed style options. This 4-Poster bed is shown with the Mission headboard and with a Mission Coffee Table. Also included is the 16" Bed Table with a drawer. 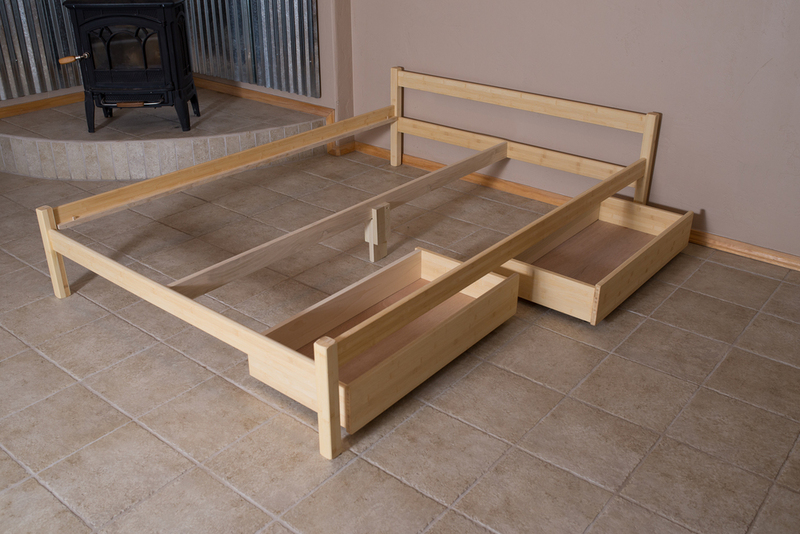 This bed table is also available in a 20" height.